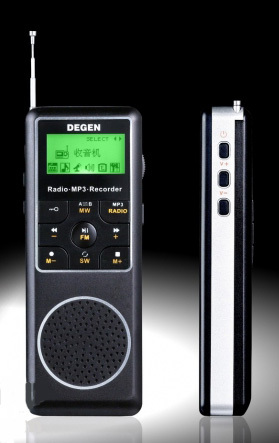 The Degen DE1127 is an innovative portable radio covering AM (520-1710 kHz), shortwave (2.3-23 MHz) and FM. The radio features 248 (FM 99, MW 50, SW 99) memories. Tuning is via up-down buttons. There is also a useful ATS (Auto Tuning Station) function that tunes available signals and stores them in memory. The DE1127 has a built-in clock with sleep function. 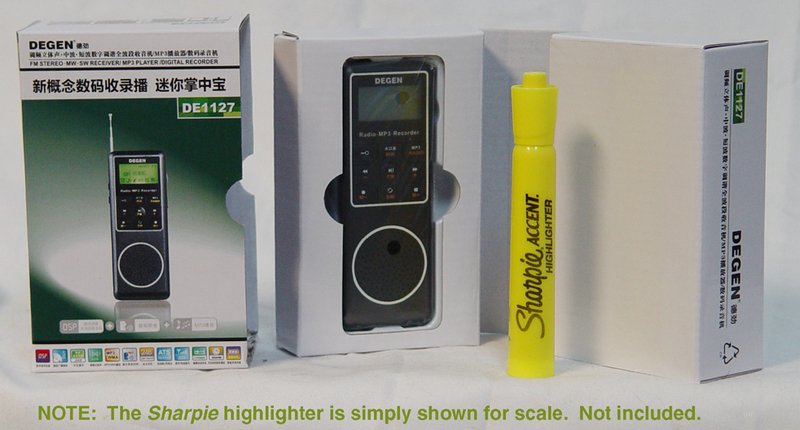 Other features include: headphone jack, backlit LCD, 9/10 kHz MW step, 31 level volume control, Signal strength indicator and battery level indicator. The coolest feature of this radio is its built-in 4GB MP3 player/recorder. 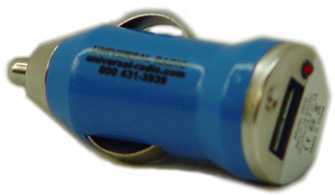 You can record directly from the radio or "live" via the integrated mic. MP3 and WMA decode is supported plus there are three play modes. 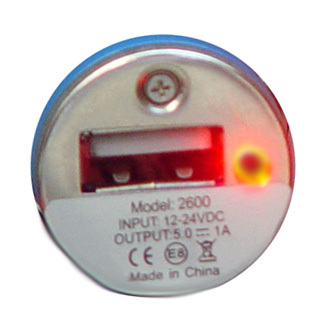 The DE1127 has a mini USB 2.0 jack. Your Degen DE1127 system includes: rechargeable BL-5C 3.7V lithium-ion battery, cloth carry pouch, stereo ear buds, USB cable plus printed English manual. 1.75 x 4.4 x 0.75" (42x110x19mm). Copyright 2013-2017, Universal Radio, Inc.